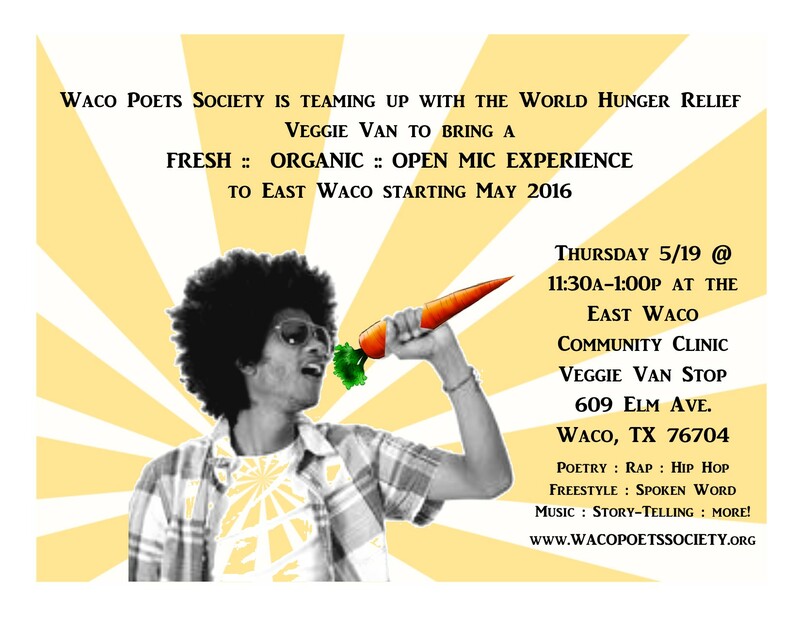 Waco Poets Society is teaming up with the World Hunger Relief Veggie Van to bring a FRESH :: ORGANIC :: OPEN MIC EXPERIENCE to East Waco starting May 2016. Join us for a FREE community open mic–all ages, styles, and creative expressions welcome: poetry, spoken-word, music, rap, hip hop, freestyle, story-telling, and more! Poetry : Rap : Hip Hop : Freestyle : Spoken Word : Music : Story-Telling : more! 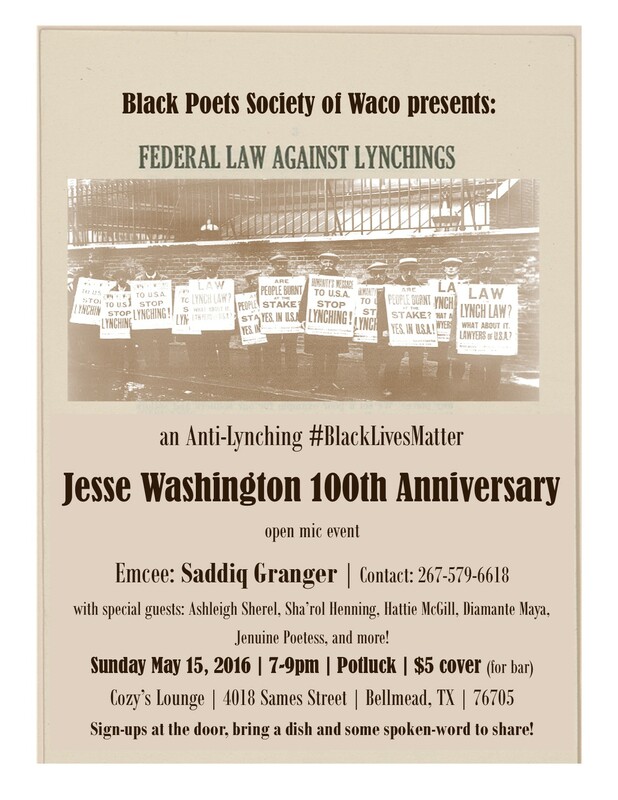 Join us for the inaugural event of the Black Poets Society of Waco on May 15th at Cozy’s Lounge recognition of the 100th Anniversary of the lynching of 15 year old Jesse Washington: an Anti-Lynching #BlackLivesMatter open mic event. This is a space organized by and for Black voices to be heard, to be honored, and to share outrage, reflections, experiences, and expressions. This is a POTLUCK event so please bring a dish and some spoken-word, music, poetry, rap, hiphop, stories, anti-lynching plays, freestyle, floetry, and reflections to share. Open to anyone ages 18 and up. 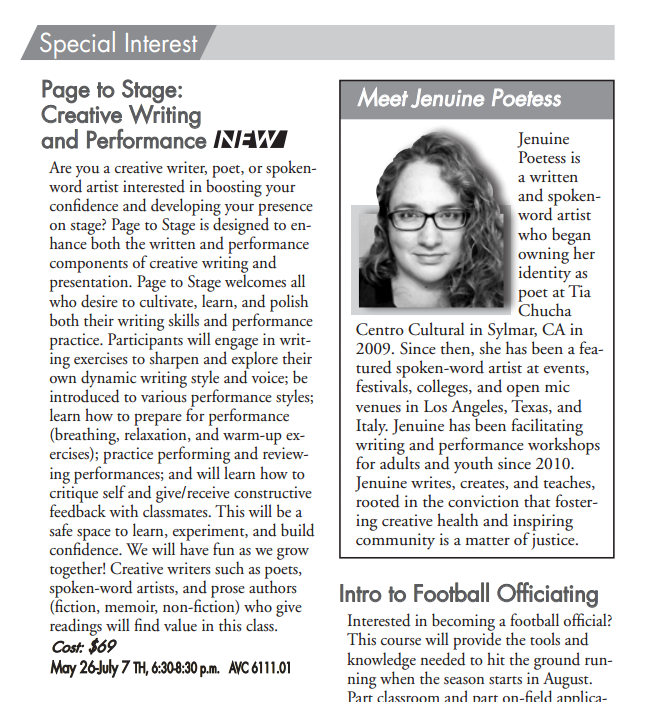 Special Guest Artists: Ashleigh Sherel, Sha’rol Henning, Hattie McGill, Diamante Maya, Jenuine Poetess, and more! 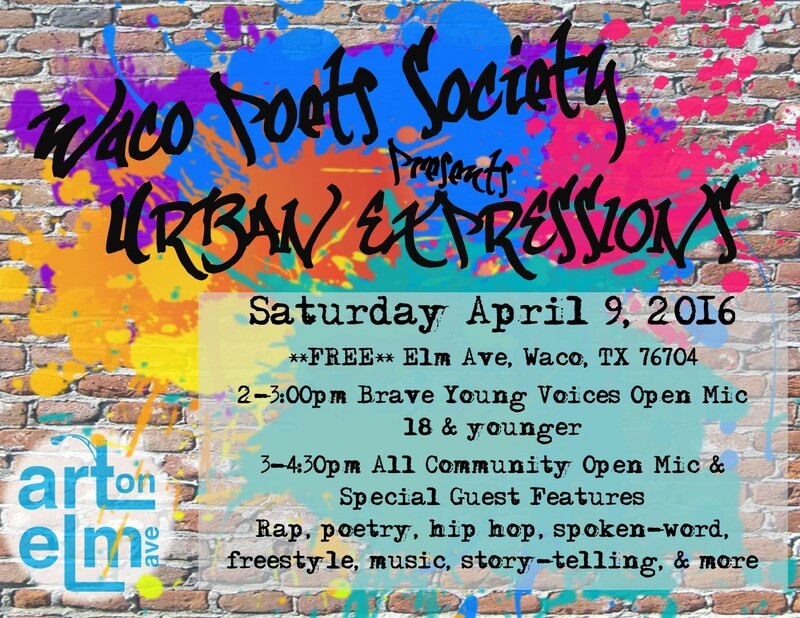 Poetry, rap, hip hop, spoken-word, music, freestyle, story-telling, and more welcome on the mic! 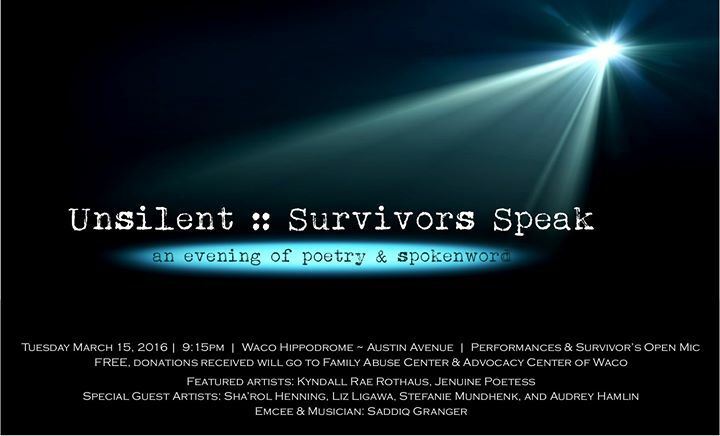 Please consider investing in Waco by contributing a 1-time or monthly amount to support the Waco Poets Society & ITWOW (womyn’s writing circle) programs! THANK YOU!!! to our past and current financial supporters. (now is also a good time to reevaluate your contributions if your circumstances &/or interests have changed). We appreciate how you have helped increase access to community arts programming! 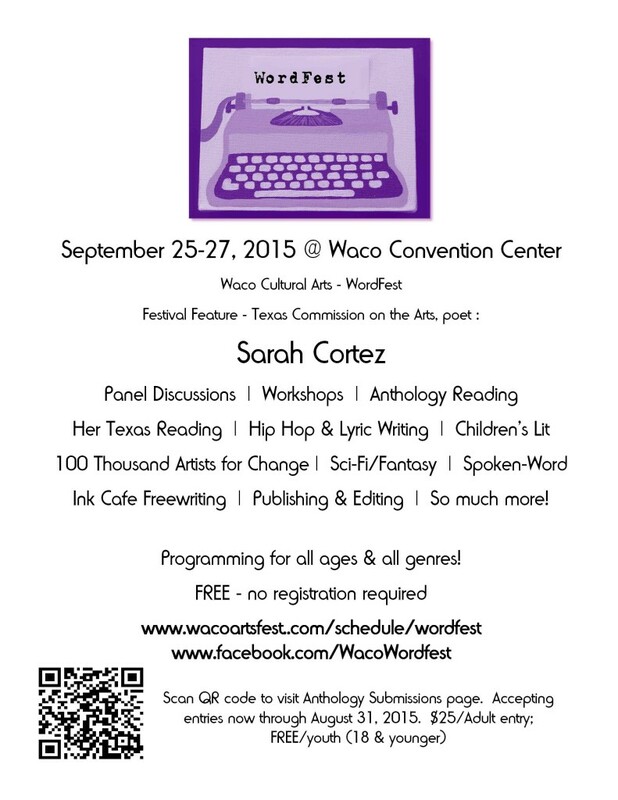 If you are interested in volunteering, please contact Jenuine Poetess at: wacopoetssociety [at] gmail [dot] com. we gather, because there are people rallying for hate, acting in violence, speaking out with ignorance. 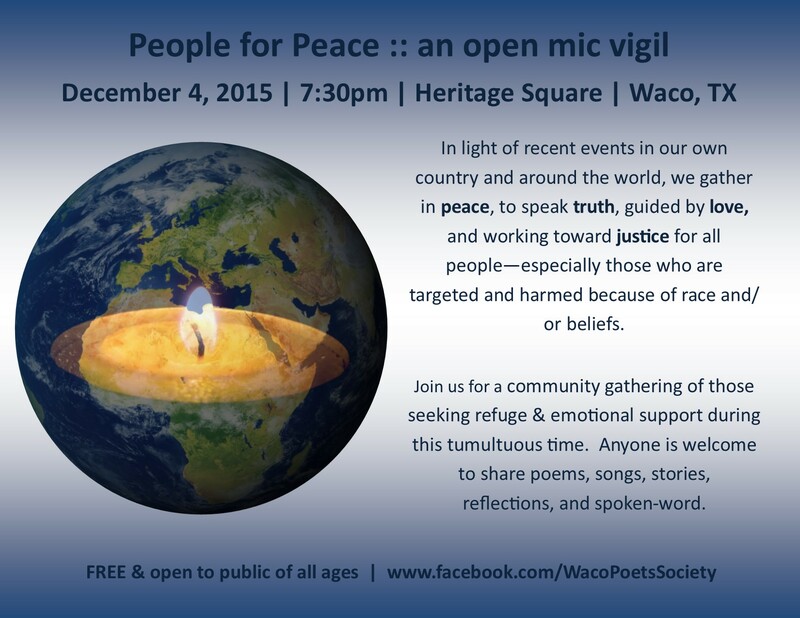 we gather, because we must co-author an alternative narrative for our community, our society, our humanity. we gather, because to remain unmoved, silent, disconnected, is to surrender to everything that threatens our thriving. we gather, because anything less is a hypocrisy of love. In light of recent events in our own country and around the world, we gather in peace, to speak truth, guided by love, and working toward justice for all people—especially those who are targeted and harmed because of race and/or beliefs. Join us for a community gathering of those seeking refuge & emotional support during this tumultuous time. Anyone is welcome to share poems, songs, stories, reflections, and spoken-word. FREE & open to the public of all ages.